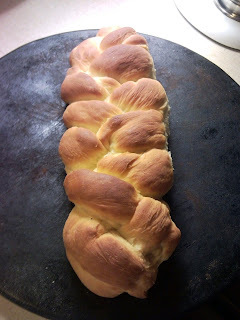 I found a simple looking braided egg bread the other day while I was surfing for Swagbucks. So today, I decided I'd try my hand at making a braided bread. And as my son Knox said, "Cool Moma, and it tastes good too!" It was so good, that I only got a picture of one loaf. The other one got eaten while it was still warm! It does take some time, but if you are like me, I was washing clothes while I was baking bread. I actually finished the bread before I finished washing clothes! I'm putting the recipe up for anyone to try. Let me know how yours turns out! 1. Combine 2 cups of flour and yeast in a large bowl. Heat water, sugar, butter and salt in saucepan and heat until warm and butter is almost melted. 2. Add butter mixture and egg to flour mixture. Beat in mixer at low speed for 30 seconds, scraping bowl constantly. Beat at high speed for 3 minutes. Stir in enough of remaining flour to make a soft dough and shape into a ball. 3. Spray a large bowl with non-stick spray. Add dough to bowl and coat dough. Cover and let rise in a warm place for 1 hour or until the dough doubles in size. 4. Pinch down dough. Place on floured surface and knead until no longer sticky. Divide dough in half, then divide each half into thirds. Roll each portion into a strand 12 X 2 in. long. 5. Coat baking sheet with non-stick spray and braid the three strands together to form a loaf directly on baking sheet. Make sure the ends of the braided loaves are turned under securely. Cover loaves and let rise in warm place for 1 hour or until the loaves have doubled in size. 6. Bake in oven at 375 for 15 to 20 minutes or until golden brown. Brush the loaves lightly with melted butter while still warm. Chameleon Tom helps you to color your Facebook!